This easy quick bread is great for just about any time of the day when you need a little pick-me-up. I love putting together this type of bread as it goes together so quickly and seems to even improve a day or two after baking. This recipe is one I adapted from an old recipe I have had in my files for many years but haven’t tried. While looking for a few easy breakfast ideas for an upcoming weekend with guests, I came across this recipe and after making a few changes was really happy with the final results. 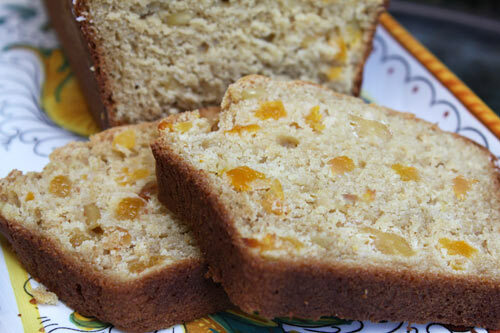 This quick bread slices beautifully, is very moist and has a really nice, light fruity flavor. The recipe calls for pureed canned apricots, and I found that baby food works great for this. The addition of the pureed fruit adds natural sweetness which is really nice in this recipe, and allows you to cut down the amount of oil needed. 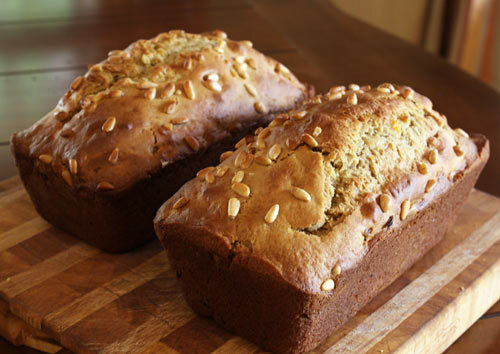 I used pine nuts in my version of the recipe because I had them on hand, but you could use any nut you prefer. If you wanted to make your bread a little sweeter, you could drizzle it with a light glaze made with icing sugar and fruit juice. Minimal amount of fat is used in this recipe as pureed apricots are used instead. The oil that is used is heart healthy olive oil. Pine or cedar nuts contain essential fatty acid pinolenic acid, oleic acid which helps to lower LDL, vitamins E, B-complex, as well as essential minerals such as manganese, potassium, calcium, iron, magnesium, zinc and selenium. The bread slices beautifully, is very moist and has a really nice, light fruity flavor. To store, wrap in aluminum foil and store in an airtight plastic bag in the refrigerator for 5 to 6 days.